Hello and welcome to another City Country Life. The linky is about loving life! I love the contrasts and similarities between the varied places we live. Each week Becca and I share a little something about what we have been up to in our local area. She is the city girl and I live here in the countryside. We would love it if you shared any posts about your week, whether that be a walk with your dog, a trip to a new city or maybe you spent time at home baking. I’m getting really excited for May, it’s when the country shows start down south. Jon and I are taking the children to the Devon County Show as part of my Family Brand Ambassadorship with the Yeovil Show 16-17th July at The Showground in Yeovil. The Yeovil Show embodies everything I love about Somerset. It’s such a good thing for our town. Celebrating Yeovil and Somerset, including locally produced products, food and drink as well as a ton of entertainment for the whole family. If you wanted to show off your particular talent there will have opportunity to enter classes too; including livestock, equine, crafts, baking, showing off your home grown produce/flowers and much, much more. I’ll be sharing more in the coming weeks and it’s such a good event for our town. We can’t wait to get to the Devon County Show which will give us a real taste of what’s to come at the Yeovil Show in July! 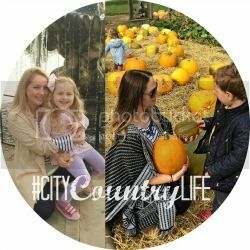 Thanks to all who read or linked up to Becca’s #CityCountryLife post last week. My favourite was Half a Dozen for Dinner Oh the places we’ve gone. Anything food related and I’m hooked! We love reading all of your posts and appreciate you all taking the time to share your posts with us. Simply follow the rules and link up below! Linkers please use the badge provided, we need the badge on ALL posts linked up. Thanks so much for your consideration. If you’d like us to link up with your linky party please do tweet or contact us! I love those kind of events, there are so many during Spring in Somerset. I think my recommendations would be The Daffodil Festival at Mells, (already happened for this year on Easter Monday) and the Bath and West Show, during Whitsun half term week. Thank you for the shout out in your post and for letting me link up again this week!